"Greetings Starfighter, You have been recruited by the Star League to defend the frontier against Xur and the Kodan Armada." These words are etched into the brains of many an adult and possibly the children of those adults. Back in the early 1980's everyone was looking to jump onto the next big science fiction adventure tale and along came a story named The Last Starfighter and while it may not have been the blockbuster many were hoping for, it did go on to become a classic in the minds of all those who ever dreamed of venturing out into the stars and finding the adventure of a lifetime. The film stars Lance Guest as Alex Rogan, a teenager living in a trailer park out west. Like most teens that are unable to break the chains of their homes, Alex longs for the day when he can become free of his home and make a life for himself out in the world. Unfortunately like most small towns, they have a way of keeping you from getting away, sometimes even for simple things like a day at the lake in Alex's case. His only outlet comes in the form of a video game called "The Last Starfighter". After another set-back in his attempts to get out to enjoy himself Alex once again finds himself playing the game. This time however things go a bit differently, in a stroke of luck or perhaps skill Alex winds up beating the game and breaking the top score. For him and everyone else in the park including his girlfriend Maggie (Catherine Mary Stewart) this is a huge event. The only one who doesn't share his joy in this victory in his mother and that is because she found out that his bank loan for college was turned down. This was Alex's one chance to escape the confines of his home and now it seems there is no chance of that. Things change though, when a stranger arrives in a car that looks like something out of Back to the Future 2. The stranger's name is Centauri (Robert Preston) and he is looking for the young boy who beat the arcade game. He presents Alex with a unique opportunity, to embark on the adventure of a lifetime. Alex cautiously accepts and finds himself whisked away headed for the stars. It turns out what he thought was a game it is in fact a reality. Everything the game portrayed is all real and now Alex has been truly recruited to the Star League. Of course once he realizes this, like any person in an overwhelming situation, he wants to run back home. But that is easier said than done and now that he is a part of this new world, it won't let him leave so easily. The enemies of the Star League are dead set on exterminating all Starfighters and Alex is one of them. With the galaxy out to kill him, Alex must find the courage within himself to enter into battle and save the universe. Anyone with a keen eye would be able to see the obvious flaws within the film. The plot has a few holes; the effects leave something to be desired especially considering the films that had come before it and at times the acting quite over the top. But sometimes a film just has certain something that strikes a chord in the heart of the viewer and that is what happened here. Now a special 25th Anniversary Blu-ray has been released bringing all of the joy of the film to your home along with a number of extras. First up is a clean, sharp and breathtaking cut of the film bearing the Blu-ray touch. Along with that are some special features like a retrospective with current interviews from the cast and crew looking back on the history of the film, a making-of-documentary hosted by Lance Guest, an image gallery with production photos, promotional material and an alternate ending. There is a feature commentary with director Nick Castle and production designer Ron Cobb who single handedly designed the GunStars. Lastly there is a D-Box Motion Enabled program that allows those with that particular service to access new content. Clearly the makers of this film as well as the studio who produced it recognized the passion the fans have for this film and did their best to put forth a worthy Blu-ray. It is films like these that remind us what we love about movies; being taken away to another world and experiencing an adventure beyond our wildest imaginations. 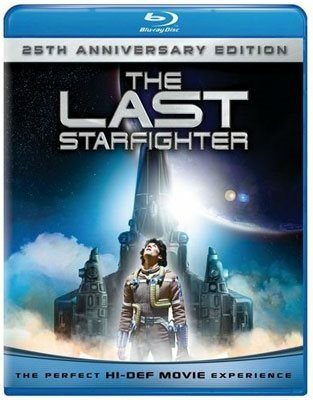 Download The Last Starfighter from the iTunes Store in Digial HD. For more information about The Last Starfighter visit the FlickDirect Movie Database.